Crickey.com doesn’t often venture into the jazz scene in Canberra, but it seems there’s a (very minor) controversy going on in its letters pages over the new government’s ways. Simon Thomsen writes: Re. "Tips and rumours" (yesterday, item 8). 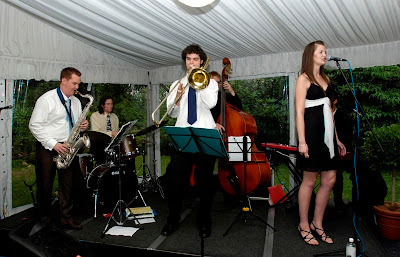 Crikey published: "For his Australia Day diplomatic corps bash at the Lodge, Rudd or his office have chosen a jazz combo, replacing the old bush bands singing Aussie songs that Howard used to favour. And I thought Rudd was an Australian music fan!" 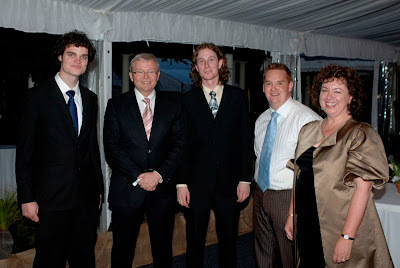 Why would Rudd having a jazz combo for Australia Day (over a bush band) be incompatible with Australian music? Fair dinkum! Has your anonymous tipster never heard of Paul Grabowsky, James Morrison, Don Burrows, Renee Geyer, Kate Ceberano, Katie Noonan, Vince Jones, Grace Knight, Bernie McGann, The Necks, The Basement, Wangaratta, Galapagos Duck and their 90s album raising funds to save the hairy-nosed wombat... Strewth cobber, I thought we voted out that sort of cultural cringe last November. (Crickey online, link, 25 Jan 2008). I’m with the respondent. It’s obvious to me that Australia is a rich, educated and culturally diverse country. I don’t like to see pollies play the nationalist/Sons of Empire game. Howard excelled and revelled in just this sort of spin. Probably there’s spin in Rudd’s choice too, even if only for the local diplomatic corps: his war on education, and a more inclusive, more modern vision of Australia. I'm much more comfortable with this than the Howard picture. Given this is an ex-diplomat entertaining the local reps of other countries on our national day, this seems a particularly significant gesture. I can claim a little part in this. When PM&C (Department of Prime Minister & Cabinet) found ANU closed for the holidays, they got onto CJ for names of Jazz School students who could play. Interestingly, they asked for students (note, not James Morrison or his ilk). I provided a few names, and James LeFevre got the gig in the end. Congrats to James. That’s memorable: playing for the PM at the Lodge on Australia Day. But congrats must also go to the PM for his support, awareness and interest. It’s a good sign. Marie LeBrun sang with the James LeFevre Quintet. The Quintet comprised James LeFevre (sax, leader), Rob Lee (trombone), Ben Foster (keyboards), Phill Jenkins (bass), Evan Dorrian (drums). To finish, let me recount my similarly memorable gig. I was playing with a Bush Band (quite a coincidence!) in the late '80s, the Bicentennial era. We played at Rupert Murdoch's property at Cavan for a party he staged for ~24 visiting US newspaper publishers and editors. All the local dignitories of the time were there: Keating, Wran and the like. Hawke arrived late and by helicopter. Impressive entrance? To us, maybe, but the world-weary editor we were chatting to just muttered "tinpot dictator". He'd obviously seen as much elsewhere. Perhaps summer is the time for blues/funky styles, out-and-out blowing, pentatonics, danceable grooves and the like. It sounds just the thing for warm nights. If so, then last night’s set by The Lethals at Hippo’s was on the money. The Lethals is Leigh Miller’s band. Leigh has impressed me over recent years with hot, funky electric bass playing in the ANUSM Commercial band and at Moruya over recent years. I was surprised to learn that he has only just entered the Jazz School, and that he was previously a classical bass student. Quite a change. Leigh’s a powerful and funky player for someone out of the classical tradition. But then classical is a good source of chops, and he displays them. He also displays a penchant for effects, and a readiness to experiment. I only caught one set, but that included an extended solo bass piece with a bass drum sounding on the beat accompanied by heavily echoed bass playing chords, harmonics, string bends, wah and more. The other tunes were more simple blows and pentatonic melodies. Scofield’s A go go and Jaco’s Teentown (admittedly a pretty raunchy melody, and a punchy groove) and two originals, one by Leigh and another by Leigh with Damien Slingsby (a capable pianist and one-time Jazz School student). The solos were satisfying all round. Carl and Ben blew us all away as they always do with good solo development, interesting ideas and occasional meanderings outside, and the balance was good so we could hear all the ideas. Sam slogged away with solid and heavy drumming which matched the style, and played a nice solo where he held the heavy beat but interpersed it with some rhythmically contorted fills. The bass had that soft and toppy modern sound which suits slap. It seemed to get lost in unison lines with the guitar, but it worked a treat on solos. It was interesting comparing this sound to Steve Hunter’s very punchy, hard, middy sound when he played Teentown with Carl only a week or so before. I also enjoyed the overall band sound on the night. It was not too loud for the venue (Hippo’s is not an easy acoustic space), and clear and well balanced. The audience was not large, but at least that meant less background noise, so it had a benefit. I only caught the first set but much enjoyed. The Lethals were Leigh Miller (bass), Carl Morgan (guitar), Ben Foster (keyboards) and Sam Young (drums). It’s great to see jazz so involved the life around town. It’s an urban music, so it’s perfect for the new Civic. I caught the Flett trio playing at the Dendy tonight. Yes, Dendy is a cinema, but it has a bar, and it’s got jazz to entertain cinema goers on Friday night between movie sessions. Despite the unusual location, this gig has been going for at least 6 months. Alison (Ali) Flett (vocals) plays with Phill Jenkins (bass). Normally the trio comprises Paul dal Broi (piano) but Julian Abrahams (guitar) was sitting in when I dropped in. It’s a standards and latin set. The PA is pretty weak near the players (although stronger at the entrance). Where I was, it was hard to catch some of the lyrics and Ali’s capable improvs. It was a shame because both were interesting. Many lyrics accompanied jazz tunes which I mostly knew as instrumentals, eg, Nostalgia in Times Square retitled as Strollin’ and sung with words from Honi Gordon. It was something new to me. Phill continues to impress. He’s playing such simple but solid walks (more panache than flash). I can understand why he gets the work. Julian played perfectly capably and comfortably despite just sitting in for the night. No surprise from trained players like this. It certainly adds to the enjoyment of a night out at the flicks, so thanks go to Dendy as well as the band. The longstanding laid-back Trident gig had a London visitor this week, and I was lucky enough to attend. In case you don’t know, Trident have been playing a gig on Tuesday nights for several years (5+?) at Dickson’s Trinity Bar. Each week, they perform a few sets of quiet but intense funk/groove from 9pm. The tunes are based on well known tunes (on this night it was Footprints, Rhythmaning, All blues, Nostalgia in Times Square, Nica’s dream, and even Madonna’s Material girl) but the references to the originals are pretty obscure and flirting. It’s a style that is urgent but restrained, and still fresh and improvised despite numerous outings. And refreshingly laid back: set 1 comprised only 2 numbers: a reggae-infected Nica’s dream, and a 35-minute medley comprising 3 tunes (a groove on G, All blues and Nostalgia). This week, Trident were joined by Mike Guy, keyboardist and ex-Jazz School student, who’s come home for a visit after 3 years in London. Mike sat in easily with his old mates, and played with conviction and involvement. His sounds were mainly Rhodes piano and Hammond organ, and both suited the soft and extended improvised tunes well. A fellow pianist commented on his melodic inventiveness, sense of space and control of tension. I liked the way he developed solos (an exercise in both tension and space) and his satisfying lines within the diatonic harmonies. Overall the band is not so much harmonically out, as rhythmically complex (it is funk after all) and melodically abstruse. This is rhythm to die for. Chris was playing masterfully, with a big ear for all that was surrounding him, and constantly changing, very intense but superbly controlled grooves. No need for volume to express emotional intensity with this drumming. Always sharp, open and precise. Luke was in tune with a great sound on his active Fender fretless 5-string playing strong patterns but freely improvised. I particularly liked his chordal and harmonic work, his clear and well intentioned soloing, and one very syncopated walk against Nostalgia. But a highlight was some free rhythmic fills that left the groove then resolved, making playful mockery of the rhythm, but confirming it by its return. I saw it as a rhythmic version of going harmonically out then resolving. Lachlan was a steadying influence, bending melodies but soloing mostly diatonically and in a scalar form on a softly distorted guitar. There was lots of time taken to build and sustain grooves, and generally toy with subtle changes, considerable sitting out by various players, and easy passing of solos. This is playing in the pocket: very appropriate for a mid-week bar gig and a great pleasure. Like having a band in your living room; a gem of Canberra jazz. Just some news from Mike to finish off. He seems to be enjoying his time in London. He leads the band Organum (which includes Niels Rosendahl), and has recently been involved in musical theatre, touring the UK with a Motown show and a Michael Jackson show that may reach London’s West End. He’s enjoying London and talks of a massive musical scene, with all forms strongly represented. Mike Guy (keyboards) was sitting in with Trident. Trident are James Luke (fretless bass), Lachlan Coventry (guitar) and Chris Thwaite (drums). Excuse the indulgence as I venture into other musical forms for a minute. The Australian Youth Orchestra is currently in Canberra for its annual National Music Camp. I attended two concerts last weekend and was stunned by the capability and commitment of these young musos. The camps are open to students aged 14-24, and the current one has an attendance of about 300. Apparently, most of the professional classical players in Australia are graduates of these camps, which are currently in their 60th year. Students are tutored by professionals covering all manner of music-related matters. This obviously includes playing but ranges to composition and even writing about music. The feature instrument this year is the harp. I heard two concerts at the excellent concert hall at the Canberra Girls Grammar School. There were symphonic works by Richard Strauss, Dvorak, Lutoslawski, Stravinski and John Talbot (one of the tutors) and chamber orchestra pieces by Corelli, Barber and Tippett. It was all truly impressive. If you read this in time, there’s a harp concert (including one work for 6 harps: presumably a very rare experience) in the National Library foyer 5.30-6.30pm Thurs 17 Jan, a performance of music composed at the camp to accompany silent films at the National Film & Sound Archive 7.30pm Friday 18 Jan, and final concerts at the Canberra Girls Grammar at 5-6.30pm (Beethoven, Bartok, Sculthorpe, Debussy) and 8-9.30pm (Dvorak, Prokofiev) Saturday 19 Jan. All free. Take a short break from jazz and dig this! Joe Zawinul’s death on 11 September 2007 ended an illustrious jazz career at the highest level, including, of course, co-leadership of that quintessential fusion band of the 70s, Weather Report. Adelaide had a Weather Report retrospective called “Cucumber Slumber” in October. Canberra had its last night when Carl Morgan led a superbly capable band to perform tunes from the Weather Report and Zawinul songbook, and one original. This was hot, powerful, loud music, with the excitement we expect from Pastorius, the beauty we expect from Shorter, and the orchestral richness of Zawinul himself. Carl Morgan (guitar) brought Steve Hunter (electric bass) and James Hauptmann (drums) from Sydney to play with him and Ben Foster (keyboards). Ben got the job at late notice and did a wonderful job on an exacting task, although he admitted he’d like a masters thesis to really get to grips with Zawinul’s complexities. He was sometimes overshadowed by an insistent (and loud) rhythm section, but did a great job. It was truly bliss at times when Zawinul’s sweet synth melodies appeared from amongst the rhythm makers. Carl himself was in great form, and I was surprisingly satisfied by role as the band’s Wayne Shorter. His collection of pedals and a guitar on the edge provided a screaming sound that went well with his ecstatic solos, funky accompaniment, and saxual melodies. Steve was a shocker! His fretted 4-string bass was a powerhouse, a machine gun fusillade of notes in the style of Jaco. Jaco’s strength was always in rhythm and melody with simple harmony. Steve played this admirably, roaming at speed over the neck, and with deceptively gentle fingerwork producing a massively hard and powerful sound. This was overwhelming playing. James held the drums side of the percussion section with an everchanging wash of rhythmic patterns and occasional solos. The tunes were mostly well-known ones from Weather Report (Palladium, Teen town, Black market, A remark you made), but there was one original from Steve Hunter’s new CD, and that classic Zawinul number from his time with Cannonball Adderley, Mercy mercy mercy. I had a few thoughts as the night was ending. Firstly, I realised I was tapping my feet on the 1-3, and I wondered to what degree WR tunes provoked this, and whether it’s a defining aspect of jazz-rock/fusion (it probably is). Secondly, I remembered some of the extended single chord blows that were part of Weather Report’s repertoire, and that in the end left me a bit cold. But then I heard the summary call and response in repeated whole-notes that finishes Palladium. It was a great choice to end the night; Weather Report bliss returned and I ended the night beaming. Thanks to Carl and crew for a memorable review of a great and sadly missed artist.